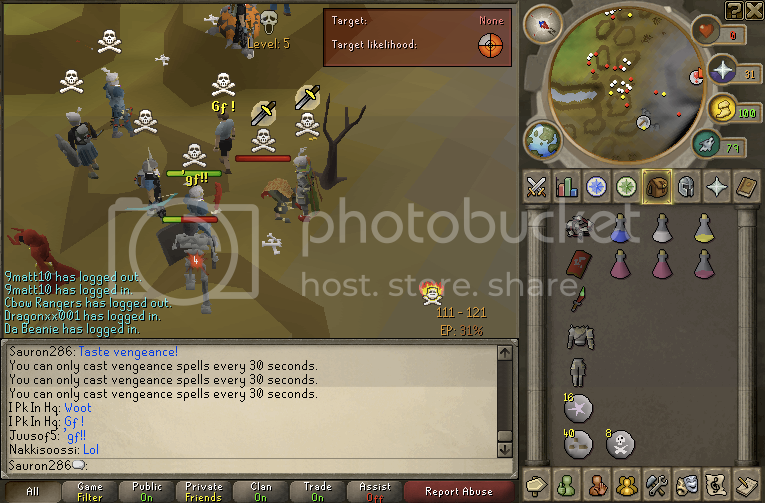 Died to WAYYYYYYYYYYYYYY to much in PVP, won't bother with those. Also tons more monster deaths but new CP etc. Edited by Shauly, 09 April 2010 - 5:27 PM. Second day after WGS/Tormented Demons came out, a friend and I went and LSed them, he got a lump, and on our last trip, I got Claws. Was the first in my old clan to get them and wanted to see if I could spec out some random people for fun 1-iteming, so I went to BH (old BH). I had no idea that you couldn't use protect item if you killed someone in there, so I specced a no-itemer, and a bit after, got maged. So I went to my prayer screen and clicked on protect item, but it wouldn't turn on. Kept trying and it wouldn't.. died and lost them. Hahah. Nobody ever told me that's how BH worked, it was before I PKed in there. Took me 5 days to solo another pair, kinda funny looking back though. This is a complete fail and I still haven't made them money back from it. So the day I finally bought a sara sword I decided to go to a bounty +1 item world and fight with it. 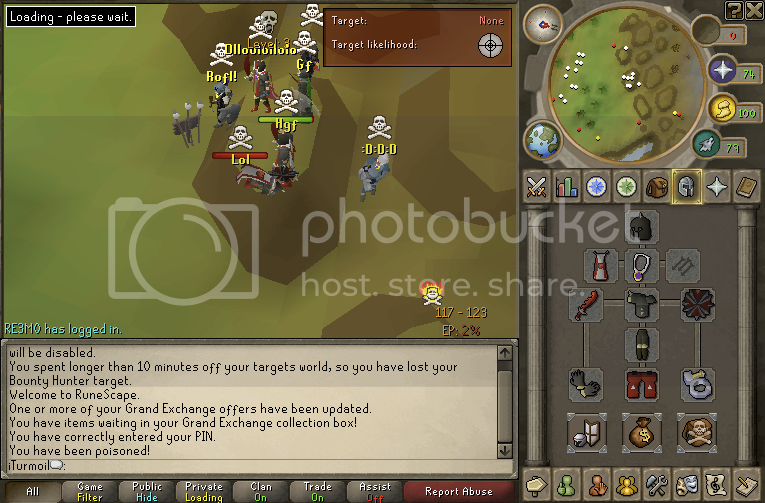 After a little while I got bored of it and decided to do f2p pking so I put my sara sword in the bank and bought a rune scimmy and switched worlds. 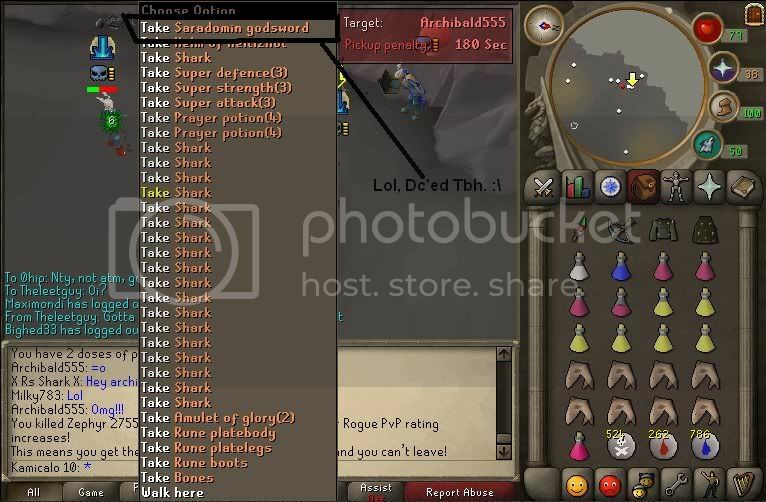 I did regular pvp and not a bounty +1 item world and had lumby tele runes in case I almost died. I used the runes to escape and when I got to lumby I decided to go back to a bounty +1 world in members so I took my sara sword out of my bank (still on f2p world). 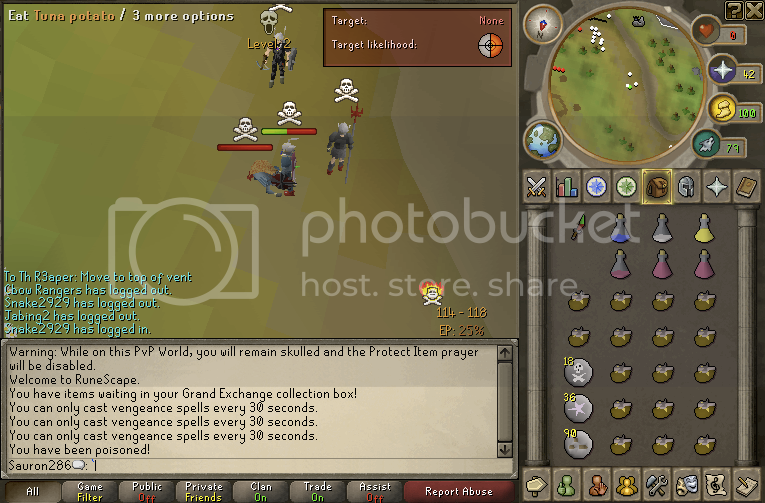 Since bounty hunter is only in Edgeville, ge, and wildy I decided to tele to the ge before switching worlds. What I forgot was that the varrock tele on f2p teles u to the center of varrock and before I could see that I was in Varrock I was back in lumby with no sara sword and full health and prayer and had died. I have only made 4 mil back from it. 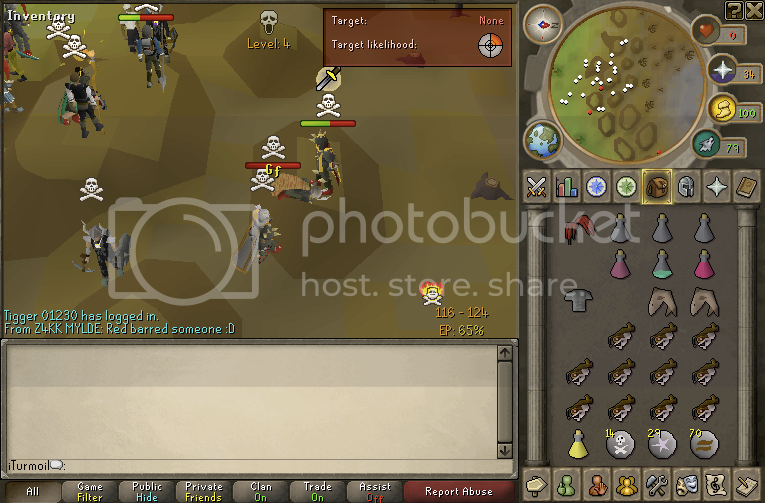 Old wildy too: running from a fight, getting my inventory ready for a new fight and forgetting to heal.. got 1 hit for my whip :c.
1 iteming in old bh with a d2h for lulz, teleported to target and he and someone else started attacking me and some nice guy was healing me (was actually thankful until I realized what he was doing lol) so I lost my d2h :x. Barely pked in old bh. Dying at bandos, disconnecting and logging out, I logged back in, raged a bit in the clanchat and logged out because I was mad... only to realize a few hours later that items still appear on the ground if you have been blessed, 35m and a fire cape down the drain. 100+ different events, active community and much more! Check out our website today! I check my Adventurer's Log and see that I just missed out on a Dragon Chainbody drop. About 6 years ago was doing a trade in Edge just before I was going pking. Had 10.3 mil cash in my inventory. Forgot to check my inventory before I went pking. Died. Lost 10.3 mil. My biggest pixel loss on RS. Edited by Awho, 10 April 2010 - 8:33 PM. Man, I keep getting all of these fails at Armadyl.. Tonight, I did another trip. My lsp is getting low, so time is running out for my hilt. This trip, we got 1 rune square shield, rune javelins, and a rune sword, as well as 2 nothing drops. Fail much? It gets better though.. Right as we got to 40kc, I was on another tab not paying attention during the kill, and by the time I switched back I had 50lp. I tabbed out just in time. Edited by Shauly, 11 April 2010 - 12:37 AM. Have you heard of Protect from Magic? And why were you looting after getting ancient when there were still enemies?.. And why didn't you run west and then south so you'd be in trees? My biggest fail was recovering my account and found it in middle of TD's. Died and lost ~80m. No idea why the guy had brought my bank in barrows + noted pots there..
EDIT:^That was today BTW; I was going to play my main again, but that gave me the oomf to keep working on my zerker! Edited by Luffy, 11 April 2010 - 7:44 AM. I have attempted the Fire Cape over 24 times and have nothing to show for it. I remember when I was around level 30 or so, my IRL friend had scammed me for full addy, I ended up chasing him around varrock for a good 2hrs. Then the next day I just beat him up. There was this other time also, I was doing GWD for the first time, and I was killing some aviansies, my friend told me to use the grapple and go to the armadyl place, he promised "better kills and more aviansies" so I did, and sadly enough I was carrying no armadyl item, so I was already like 50hp, then I get a little lag from swinging.... Then I see my player splattered on the floor with a red bar over his head. I'm like FML. 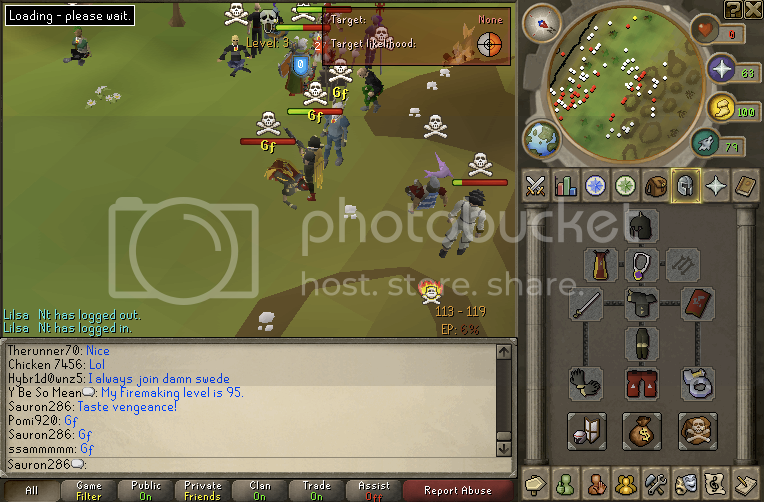 Was carrying a good 5M in gear/addy bars. Watching a new episode of Naruto in another window whilst slaying FIRE GIANTS (after 99) and I died, losing my torso. 'tis was the first (and last) time I ever died Slaying... same with losing a torso. And getting scammed for 40M back when it was actually worth something. Was doing edge style dms back in OLD BH crater. Was getting maged by a hybrid so i tried to leave. The exit door was towards the top of the screen, and i accidentally clicked off the screen, and clicked one of the buttons that used to be there that took me to the main page. I thought I had died. So I logged back into the same world, to find out I hadnt died. I logged in with 27 hp, and my protect item off. I got instantly koed and lost my sgs. Heres the pic the other guy took. 107m at the time.